Insulin-like growth factors (IGF) I and II are peptides that are growth factors for a broad range of cell types. In serum and other body fluids more than 99 % of the IGF´s are bound to Insulin-like growth factor binding proteins (IGFBP´s). Six high affinity binding proteins have been characterised until today. In human serum IGFBP-3 has the highest concentration and more than 95 % of the IGF´s are bound to the single binding site of IGFBP-3. It prolongs the shelf life of IGF´s and is the main circulating reservoir for IGF-I and –II. The availability of IGF-I and –II is regulated by a complex system. Beside the regulation of the biosynthesis of the peptides another mechanism is to enhance the bioavailability by decreasing the affinity of the IGFBP´s. One of the mechanisms is the release of bound IGF´s from IGFBP´s by proteases, generating fragments with reduced or no affinity for the IGF´s. For IGFBP-3 there are reports on a number of proteolytical fragments of 30 kDa, 22 – 25 kDa and 16 kDa, with reduced or no detectable affinity for the IGF´s. IGFBP-3 proteolytic activities have initially been found in pregnancy serum. Later fragments have been detected in other body fluids (1). Increased proteolysis has been observed in malignancies, as e.g. breast cancer (3) and leukemia (8), in malnourished elderly people (4), in insulin dependent diabetes mellitus (5) and after extensive exercise (6). IGFBP-3 protease activity has been measured by different techniques as immunoblot and ligand blot (2, 3, 4, 5, 6, 7), substrate zymography (7), FPLC (8) or in assays using 125I-IGFBP-3 (10). ibt IGFBP-3 PROLICIA uses glycosylated IGFBP-3 as a substrate. Only functional IGFBP-3, i.e. IGFBP-3 and fragments that can bind IGF´s are detected, but not the fragments that have lost the affinity to IGF-II. It combines the advantages of western-ligand blotting with the speed and convenience of an ELISA. The test uses glycosylated IGFBP-3 as a substrate for proteases. After proteolysis the sample is mixed with the biotinylated IGF-II. The functional IGFBP-3 is bound to the wells of a Streptavidin coated microtiterplate via the biotinylated IGF-II bound and detected by a monoclonal antibody to human IGFBP-3. The primary antibody, which is bound to functional IGFBP-3 is then detected by a secondary peroxidase-conjugate antibody. The reaction with the substrate is stopped by addition of acid and the blue colour turns to yellow. 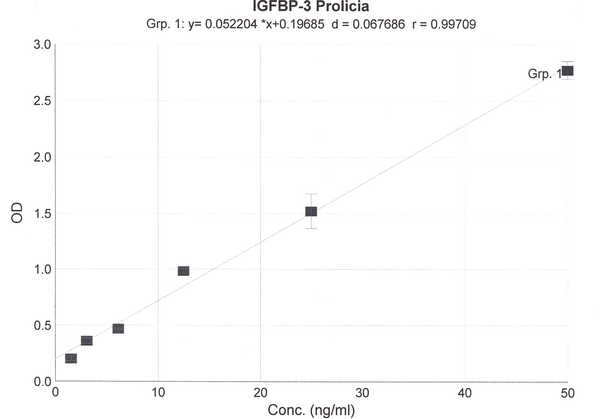 The measured absorbance is directly proportional to the quantity of functional IGFBP-3. 1. Microtiter plate, 96 wells, coated with Streptavidin. 12 x 8 well strips in a foil pouch with desiccant. 2. Substrate: 5 µg recombinant IGFBP-3, lyophilized. 3. Ligand: 10 µg biotinylated IGF-II, lyophilized. 4. Antibody: Antibody to human IGFBP-3, 50 µg, lyophilized. 5. Conjugate: Goat-anti mouse IgG-Peroxidase conjugate, 50 µl, dilute 1:2000. 6. Assay Buffer, buffered solution for dilution of proteolyzed samples and dilution of Conjugate, 50 ml, ready for-use. 8. Substrate, TMB, 11 ml, ready for use. 9. Stop Solution, 0,2 M sulfuric acid, 11 ml, ready for use. Caution: caustic. The kit should be stored at 2 - 8 °C. The unopened kit is stable until the expiry date printed on the kit label. Openened components are stable until the expiry date, except the reagents and working solutions mentioned in 7.1. The ibt IGFBP-3 PROLICIA is for in-vitro use only! This product must be used strictly in accordance with the instructions for use. ibt - immunological & biochemical testsystems GmbH will not be held responsible for any loss or damage howsoever caused, arising out of non-compliance with the instructions provided. The standards contain human serum. The serum has been tested for HbsAg and antibodies to HCV and HIV-1 and HIV-2. The serum has been found to be negative. Because no test and no certificate can absolutely guarantee the absence of infective agents, all materials and also all samples should be treated as infectious materials and precautions should be taken as e.g. adequate clothing, wearing gloves etc. All waste should be disposed following the regulations for infective materials. The stop solution and the acidification buffer contain acids that are harmful. Avoid contact with skin, eyes and mucous membranes. TMB Substrate is a suspected carcinogen. Avoid contact with skin, eyes and mucous membranes. The reagents contain a preservative in very low concentration. Avoid contact with skin, eyes and mucous membranes. 7.1.1 Bring all reagents and microtiter plate to room temperature. Remove the required quantity of strips from the microtiter plate. Strips not to be used immediately must be stored in the sealed bag with the desiccant at 4 °C. 7.1.2 Reconstitute IGFBP-3 with 100 µl distilled or demineralized water to yield a 50 µg/ml solution. Mix carefully and keep at room temperature for at least 30 minutes to ensure complete dissolution. The dissolved IGFBP-3 is stable for one week at 4 °C. Aliquots may be stored frozen for at least one month. 7.1.3 Reconstitute biotinylated IGF-II with 0.5 ml distilled water keep at room temperature for at least 30 minutes to ensure complete dissolution. The dissolved Biotin-IGF-II is stable for one week at 4 °C. Aliquots may be stored frozen for at least six months. Avoid freeze-thawing cycles. Prepare the required quantity of working solution by dilution of 1 volume of the stock solution with 250 volumes of Assay Buffer. The biotinylated IGF-II may be used in control exeriments by ligand blotting (see application note IGF005) at a dilution of 1: 100 to 1: 500. 7.1.4 Reconstitute the Antibody with 50 µl of distilled or demineralized water to yield a 1 mg/ml stock solution. The stock solution is stable for at least one month at 4 °C. Prepare the required quantity of working solution by dilution of 1 volume of the stock solution with 2000 volumes of Assay Buffer, e.g. 1 µl antibody to 2 ml Assay Buffer. The antibody may be used in control experiments by immunoblotting (procedure see application not IGF007) at a dilution of 1:500 to 1:1000. 7.1.5 Prepare the required amount of washing buffer by dilution of 1 volume of the concentrated washing buffer with 9 volumes of distilled or demineralized water. Use within one week. 7.1.6 Prepare the required amount of conjugate working solution by diluting the conjugate 1 + 2000 (e.g. 2 µl Conjugate plus 4 ml Assybuffer). Use the same day. Proteolyse suitable aliquots of glycosylated IGFBP-3. After proteolysis stop with suitable protease inhibitors. Dilute samples to fit into the standard curve. Please note: The proteolytic activity of IGFBP-3 proteases may be affected by the presence or absence of IGF´s. There are differences in proteolysis of glycosylated and non-glycosylated IGFBP-3 as it is used commonly in the assays with I125-IGFBP-3 (10). Intrinsic “free” IGFBP-3 (i.e. Functional IGFBP-3, not complexed with IGF-I or IGF-II) may affect the results. Appropriate controls should be performed. The Assay Buffer contains BSA and may affect proteolysis. As an example we have tested degradation of biotinylated IGFBP-3 with plasmin using the conditions described in a paper by Vorwerk et al. (13). For proteolysis, we incubated 0.5 µg of IGFBP-3 with 10 µg, 5 µg, 1.25 µg 0.25 mg and 0 mg (as control) in a total volume of 40 µl Tris-HCl pH 7.5 for 30 min at 37 °C. The reaction was stopped adding 10 µl of a stock solution of a protease inhibitor cocktail (1 Complete Mini tablet, Roche Applied Science, in 1.5 ml water). An aliquot was diluted to 10 ng/ml and 100 µl were mixed with 200 µl of biotinylated IGF-II. 100 µl of the mix were pipetted in duplicates into the wells of the Streptavidin coated Microtiterplate and IGFBP-3 concentration was measured against a standard curve of biotinylated IGFBP-3 following the protocol described above. The concentrations of the plasmin digested samples are found in the range of 2.5 to 6 ng corresponding to a degradation of biotinylated IGFBP-3 from 75 to 40 %. Standard curve of the example (not to be used for calculation of actual results). You can use the IGFBP-3 as well for control experiments. For immunoblotting (see application note IGF007) the monoclonal antibody of this kit (dilution of 1: 500 to 1:1000) and the conjugate may be used (dilution of 1:1000). The antibody is also available seperately (Product Code M02-IGFBP3). For western-ligand blotting (see application note IGF005) the biotinylated IGF-II may be used at a dilution of 1:100 to 1:500.